Truck accidents, whether they involve 18-wheelers, garbage trucks, heavy haulers or commercial trucks, can cause significant damage. The sheer weight of these vehicles makes them difficult to stop and often the contents that they carry make them even more dangerous in the event of a crash. If you’ve been in an 18-wheeler accident you need a tough experienced truck accident attorney. The regulations regarding these vehicles and the information that they need to maintain are growing increasingly more complex. As a result, it is crucial to hire an attorney experienced in 18-wheeler injury cases. At The Nigam Law Firm, we know what information to ask for and the best way to use that information in your case. One of the key elements to any successful truck accident lawsuit is a thorough investigation close in time to the accident. Do not wait to hire an attorney with expertise in truck litigation. Although law enforcement officers may investigate an 18 wheeler accident, The Nigam Law Firm and it’s team of trusted experts, know what to look for. Time is of the essence in gathering evidence and recording testimony. In a complicated trucking case, it is crucial to start the investigation as soon as possible in order to preserve the evidence. Dangerous road conditions such as unmarked curves, obstructed visibility, dangerous drop-offs, unsafe entrance or exit ramps, or missing or defective guard rails. Drunk driving or driving under the influence of drugs, including prescription medications. Driving while tired or without adequate sleep. Employers failing to adequately train drivers or maintain safety standards. Employers failing to perform background checks and hiring drivers with a history of safety violations. Failure to properly maintain and inspect the truck. Often brakes may not be working or running lights are not operational; these issues together with other maintenance issues can lead to a crash. These injuries can cause significant losses for those involved. Those injured and the family members responsible for caring for them may not be able to work, losing valuable income. These injuries may require significant medical care including surgery, medications, and frequent trips to medical providers. Those responsible should be held accountable for your harms and losses. When truck drivers and their employers fail to uphold their responsibilities and injuries result, The Nigam Law Firm is here to help. 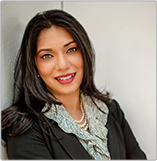 Anjali Nigam has spent years working against the trucking industry and has the experience, knowledge and resources to conduct a thorough accident investigation.